You switched to our site for United Arab Emirates. 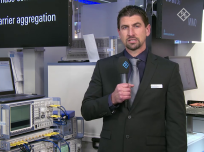 Rohde & Schwarz demonstrated their complete location based services test coverage from R&D to conformance and carrier acceptance at the GSMA Mobile World Congress 2015 in Barcelona. The R&S®TS-LBS supports all major modern positioning technologies including OTDOA, eCID, A-GNSS and hybrid (satellite and network). Also demonstrated at MWC was the ability to replay real-world satellite signals and generate all corresponding assistance data with the R&S®TS-LBS test system. The R&S TSMW drive test scanner can record the complete RF environment including satellite signal and other signals present at the time, and these are stored on the R&S®IQR with 16-bit resolution.